Mullvad VPN Review – Highly Secure VPN That Puts Your Privacy First! Mullvad VPN Review – Highly Secure VPN That Puts Your Privacy First! 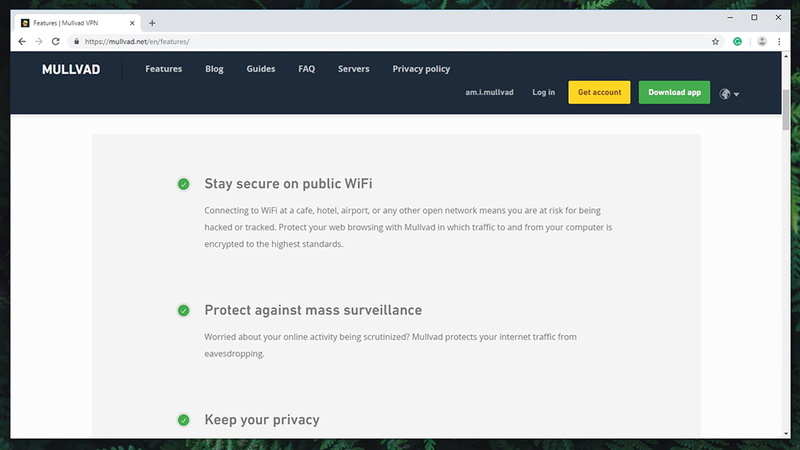 Mullvad VPN Review 2019 – Incredibly Secure VPN That Puts Your Privacy First! Here at TechNadu, we are dedicated to reviewing every VPN service that comes our way. And after testing several dozens of VPNs so far, we’re happy to have Mullvad in our hands. We’ve been hearing about this service and its dedication to protecting each individual user from today’s dangers of our digital world. However, it’s time to put this VPN to our tests. Unlike numerous other VPNs, Mullvad comes without claims that many would think are over-the-top. It doesn’t claim to be the fastest VPN on the market nor that it unlocks every imaginable service out there. Instead, it is focused on privacy and protection of your personal and sensitive data. 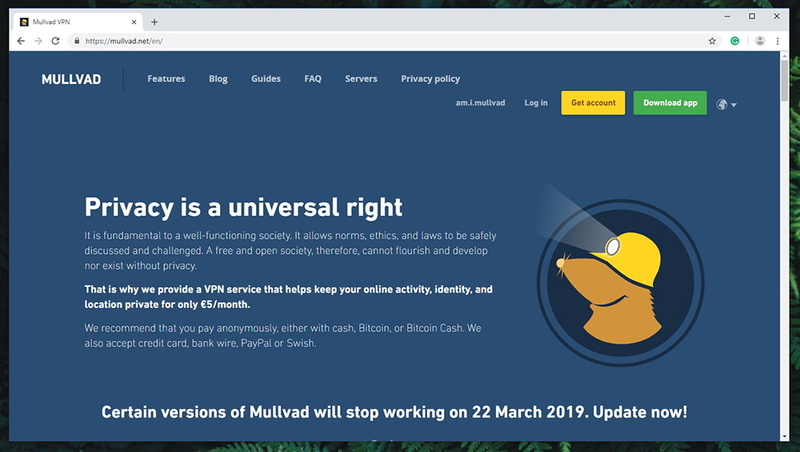 And as you can imagine, we’re going to test all those claims for ourselves – so, welcome to our hands-on review of Mullvad VPN! We’ll start things slowly by introducing you to this VPN service. 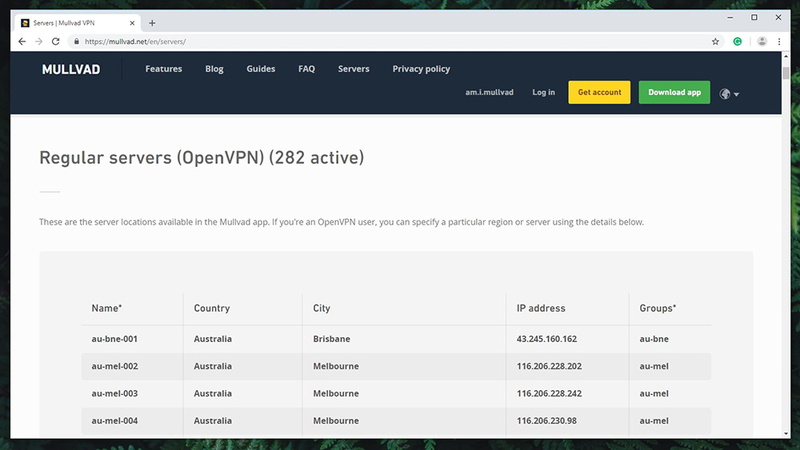 We’ve prepared several handy tables for you, where the first one extracts the most important information about this VPN. So, let’s start getting to know Mullvad. Windows, MacOS, Linux, iOS, Android, Chromebooks, Routers. 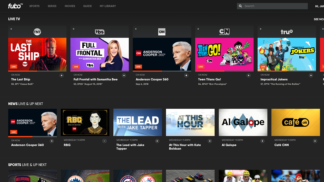 With the basic information behind us, we’ll proceed with the world’s most popular media streaming services. As you can see in our article on how we review VPNs, we think that media streaming is an important aspect of every VPN. So, can Mullvad join our list of the best VPNs for streaming? Here are the results. Lastly, we are going to provide a quick look at our findings – for those who are in a rush. However, we do suggest reading this entire review if you want to truly get to know Mullvad. So, here are our quick conclusions. Total online security and anonymity; Amazing performance; Barely noticeable throttling; No data collection; Unlocks Netflix; Simple pricing plan. Not the easiest manual setup; Relatively small server network; Limited customer support. If you care only about privacy and online safety, Mullvad provides an answer to your concerns. However, it’s not the easiest VPN to set up and it’s not the best option for streaming. And now, we are ready to dive deeper and see what Mullvad has on offer. We are going to dissect this VPN into its smallest bits to find out whether you should trust this VPN and if it’s worth the money. First of all, you should know that we’ve spent quite some time testing Mullvad. Unlike the majority of other reviews on the Web, everything found in this article is a result of thorough testing. With this said, we’ll begin by taking a look at this VPN’s reputation and background. Mullvad is based in Sweden and has done plenty to protect each individual customer. Also, there are no records of previous data leaks. Our Score: 10/10. You might be wondering what’s the purpose of this segment? Well, you need to be aware of where your chosen VPN comes from as that dictates the way that your personal data is handled. Each country has its own set of laws, and some can be quite restrictive. That’s why top-rated VPNs choose exotic locations as their base of operations, which gives them a competitive edge. Mullvad comes from Sweden, and this country is a member of the 14-Eyes Alliance. This is a group of highly developed countries that freely collect and share data about their citizens. Even though this group was created with the sole purpose of protecting their borders, today’s digital world has expanded its role. So, does that mean that Mullvad is not a good option? 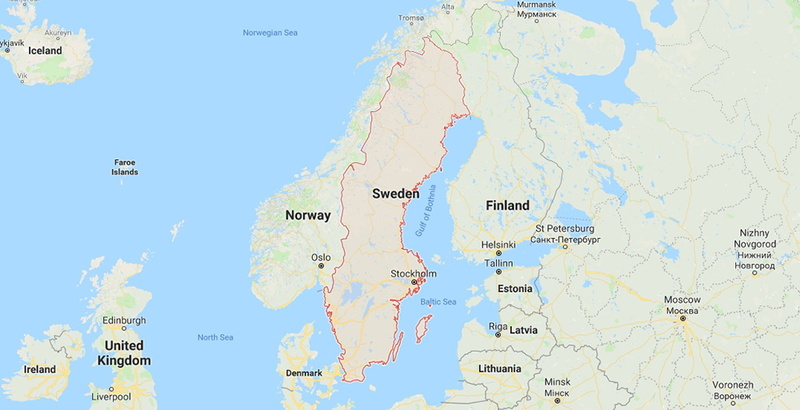 Mullvad understands that some might think that Sweden is not a good place to base VPN operations. However, you should know that this country is one of the most progressive countries in terms of personal data protection. First of all, there’s the General Data Protection Regulation act that all EU members share. Then, there’s the Electronic Communications Act (LEK) that covers the entities that must store and keep data. As per this law, VPN providers are not included – providing a way for Mullvad to avoid data collection. As this service states, the key to running a successful VPN business is to store as little data as possible. If they don’t have any data about you, they won’t be able to give anything even when forced. Therefore, we conclude that Mullvad has covered the basics quite well. 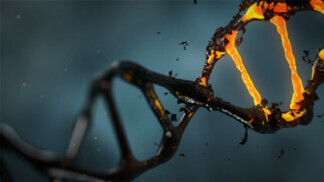 A few years back, Mullvad has been suspected to have certain security vulnerabilities. More precisely, it was said that Mullvad allowed DNS hijacking. This report included a large number of highly popular VPN providers, many of which issued their response saying that the report was false. In the meantime, Mullvad remained silent, letting others do the job of discrediting the report. In the end, this report failed to cause any commotion and it was quickly described as ‘sensationalistic’. What’s important to be said is that Mullvad is often regarded as one of the most secure VPNs on the market. It comes with no data leaks or data breaches in the past, which is good news. This VPN has been on the market for 10 years now, so it’s quite an achievement that it comes with a clean slate in terms of its reputation. Mullvad natively supports only Windows, MacOS, and Linux – and you’re asked to set it up manually on other devices, which is far from ideal. Our Score: 5/10. Ideally, you need a VPN with broad platform compatibility. This allows you to install its app natively and use the VPN without complications. So, let’s take a look at how Mullvad meets this set of criteria. DD-WRT, OpenWRT, Tomato routers, and more. When it comes to Mullvad, the situation isn’t good. As you can see in the table above, this VPN is present on a wide range of currently popular platforms. However, some of those are not native apps, which makes this situation all the more complicated. Speaking of native apps, you can use Mullvad on Windows, MacOS, and Linux – so the big three most popular platforms are covered well. When it comes to Android and iOS, there are no native apps. Instead, you will be redirected to a somewhat complicated manual installation process. And the same applies to routers as well. 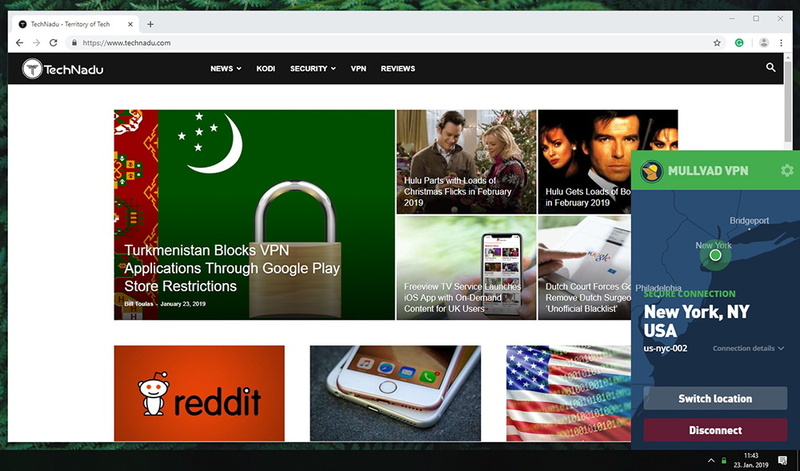 It is not unusual for today’s VPNs to offer a very nice selection of native apps that cover all desktop and mobile platforms, and even Web browser extensions. Even though it’s been available for close to 10 years now, Mullvad is still behind today’s top-rated VPNs. You can install Mullvad on desktop systems in a matter of seconds. However, installing the VPN on Android and iOS is unnecessarily complicated. Our Score: 5/10. To get started with this VPN, you first need to sign up for a new account. Mullvad takes a different approach to this process as it tries to eliminate any personal data. Instead of signing up with an email and password, you’ll be assigned a numbered account. And since you can pay via Bitcoin (and other anonymous payment methods), you can be 100% anonymous right from the start. If you use Windows, MacOS, or Linux, you can download the official application from the VPN’s website. We’ve tested it on Windows, where the installation file is around 53MB in size. Download the file and then double-click on it to lunch the Installation Wizard. What’s interesting to note is that the installation will begin as soon as you open the file, so the entire process takes only a few seconds of your time. Once the software is installed, double-click to run it. You’ll be asked to enter your account number, and that’s it. From this moment on, you can select a secure server and connection. Unfortunately, the installation process of Android and iOS can be quite complicated, especially if you’re new to VPNs. Mullvad is here to help with its 7-step guide, which eases the situation a bit. However, this isn’t an excuse not to offer a fully-featured app. Mullvad comes with a set of standard features, some of which are more technical than others. There’s no ad-blocking, anti-malware, or split-tunneling. Our Score: 7/10. Today’s VPNs are highly powerful applications powered by advanced tech. However, their feature sets vary greatly. That’s why we check if each VPN covers the basic features well and if there are any interesting advanced features for seasoned users. So, let’s take a look. As you can see, Mullvad checks (almost) all of the right boxes. There are built-in DNS and IPv6 leak protections. And even though it appears that this VPN doesn’t have a kill-switch, it’s actually incorporated into the application. In other words, you can’t turn it off or on, which does seem a bit strange. That’s why you’ll find tutorials on how to use this technology when downloading torrents (via qBittorrent), which once again tells us that Mullvad is a somewhat technical solution. Sadly, this VPN doesn’t bring any kind of ad blocking or anti-malware, but you can get protected via other plugins or tools. And there’s no split-tunneling feature either. And of course, just as you would expect from any premium-priced VPN, it doesn’t have any limitations in terms of bandwidth or data. Mullvad comes with a relatively small server network of around 340 servers even though it’s close to a decade old, so we’ve expected more. Our Score: 3/10. It’s crucial to know how many servers you can use with Mullvad. After all, you want to have plenty of servers that could host a large number of users at once, without affecting performance. First of all, you need to know that top-rated VPNs come with thousands of servers. For example, NordVPN has more than 5,000 VPN servers right now, while ExpressVPN has more than 2,000. And as you can see, Mullvad offers around 340 secure servers in 37 countries. Knowing that this VPN has been on the market for 10 years now, we’re surprised to see its server network being so small. On the plus side, you can select a specific city in many cases and there are no limitations to how many servers you can use. In other words, you are completely free to hop between servers any time you want. Considering the size of its server network, we are curious to see what of performance this VPN brings. This is something that we’ll test later on in the article, so keep on reading. Mullvad’s UI is nicely designed but can be somewhat frustrating to use in the long-run. It also brings a very limited option of fine-tuning. Our Score: 6/10. During the last year, this VPN went through numerous changes. Today, it brings an all-new interface designed to push Mullvad into a new digital era. So, let’s see how well this UI is designed and whether it’s suitable for both beginners and seasoned users. Interestingly enough, Mullvad doesn’t come with a ‘free-floating’ window. Instead, it’s tied to your Windows taskbar and you can open it by clicking on its icon (on the right side of the screen). As you click elsewhere, this window disappears. The home screen of Mullvad brings a non-interactive map in the background and two buttons at the bottom of its interface. You can browse the list of available servers, or you can click on the ‘Secure My Connection’ button to connect to a secure server. By browsing the list of available servers, you’ll see a long list of countries and many of them let you pick an individual city. This is especially handy for US-based servers, as there’s a sizeable list of cities. In the top-right corner of Mullvad, you’ll see a cogwheel icon. 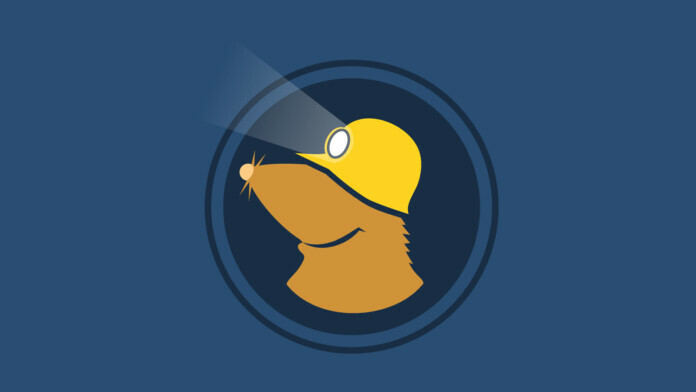 By clicking on this icon, you can dive deeper into the application, so here’s an overview of everything that you can see and do here. Account: This is where you can see when your account is due to expire, and you can extend your account’s duration from here as well. There’s also a button that lets you log out of the application. Preferences: Mullvad’s preferences bring a set of three options. 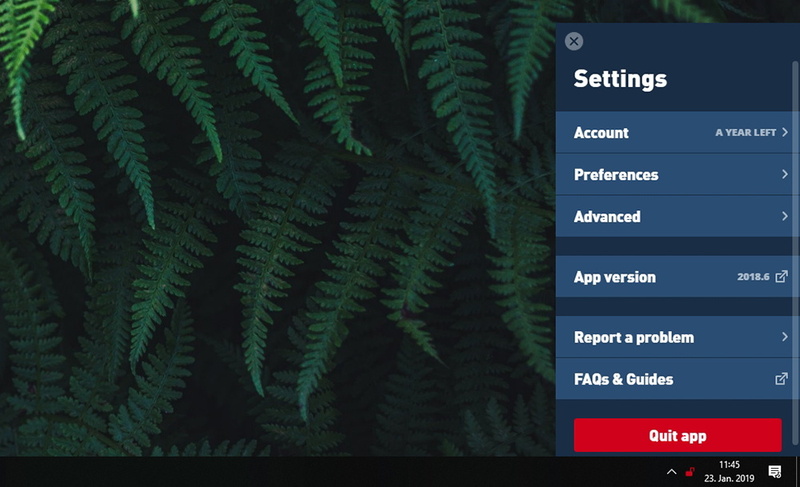 You can choose if you’d like to auto-start the VPN every time you power on your computer, and you can auto-connect to a certain server. 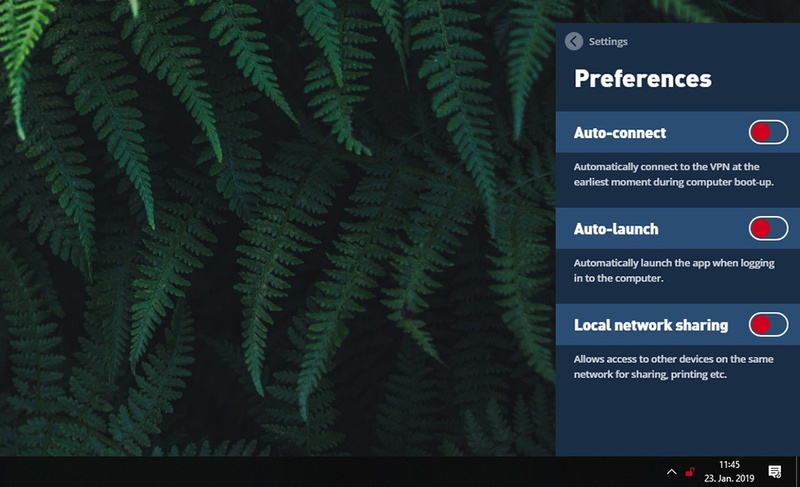 There’s also an option to allow your computer to still be discoverable on the local network, which is important for printing, screen mirroring, file sharing, and more. 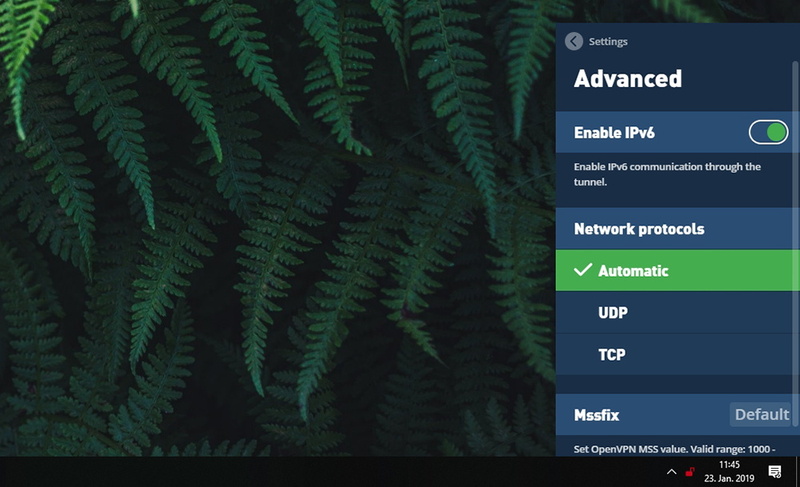 Advanced: In this segment, you can enable/disable IPv6 data protection and you can choose from the available VPN protocols that we’ll discuss later on in this article. App Version: This is where you can check the current version of Mullvad. By clicking on this segment, you’ll be taken to the VPN’s website, where you can see whether there’s a new version available for download. Report a Problem: If you’re facing any kind of problem, this is from where you can open a customer support ticket. FAQs & Guides: The final option serves as a link to Mullvad’s website, where you can check some helpful support resources. All in all, we like how Mullvad is designed. However, its current state seems like the first step towards a fully functional interface. There’s a lot of clicking involved and going back and forth. Interestingly enough, we’ve tested Mullvad on a touch-screen notebook as well, which is where we found its interface to be more functional. It’s also interesting to note that even though Mullvad is often a highly complicated solution (as you need to install it manually on iOS and Android, for example), its Windows app is overly simple. There are a few options here and there, and there’s not much you can do. Therefore, we think that newbies are going to really like it. Mullvad is able to unblock and stream Netflix, while other popular services are not available. And, it also fully supports P2P file transfer. Our Score: 4/10. Now, we are going to test Mullvad’s ability to unlock the world’s most popular media streaming websites. Take a look at the table below to see the results. 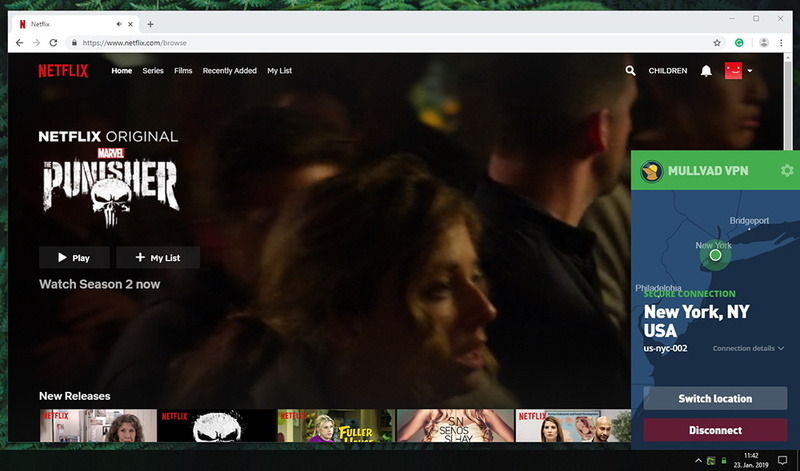 When searching the Web for Mullvad, you will see polarizing opinions on whether this VPN works with Netflix, Hulu, BBC iPlayer, and Prime Video. However, we’ve spent quite some time testing all of Mullvad’s servers, and they weren’t able to unblock the popular websites (except for Netflix). This VPN brings a wide range of servers located in the USA. After testing all of those, we’ve found a single one able to unblock Netflix (located in New York). This means that Mullvad can unblock Netflix, at least for the moment – but we can’t give any predictions whether this system will work in the future. 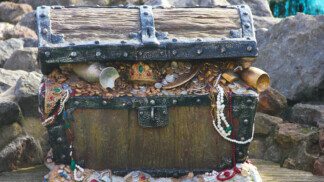 When it comes to torrenting, we have good news. 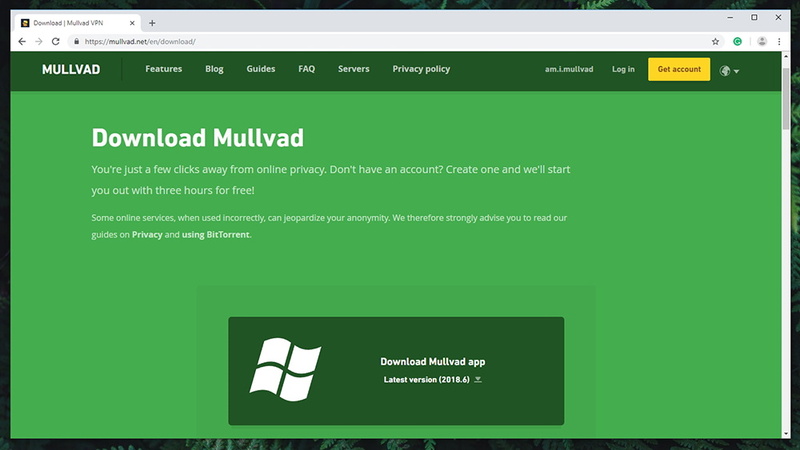 Mullvad fully supports P2P file transfer, and it even offers a guide on how to secure your connection by using qBittorrent. 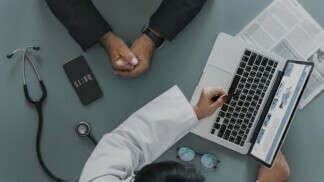 For the best results, we recommend connecting to a nearby server which in turn should provide reliable performance. Mullvad is one of the most secure VPNs. It doesn’t collect your personal data, uses the latest VPN protocols, and has no DNS leaks. Our Score: 10/10. To make sure no one can read your data, Mullvad uses 256-bit encryption. This is considered to be the standard of today’s VPNs, as this kind of encryption is practically uncrackable. It’s used by major financial institutions and government agencies, which tells us a lot. And when it comes to available protocols, Mullvad uses OpenVPN and WireGuard. OpenVPN is the most secure protocol that you can use, keeping third-parties away from your data. Even though it does bring some throttling to your Web connection, you can be 100% safe online. And WireGuard is actually something that we don’t see often. Available in certain versions of Mullvad, this protocol is a successor to the IPsec. This protocol tries to find a balance between security and performance, keeping you safe online without having a prominent negative impact on the speed of your Web connection. 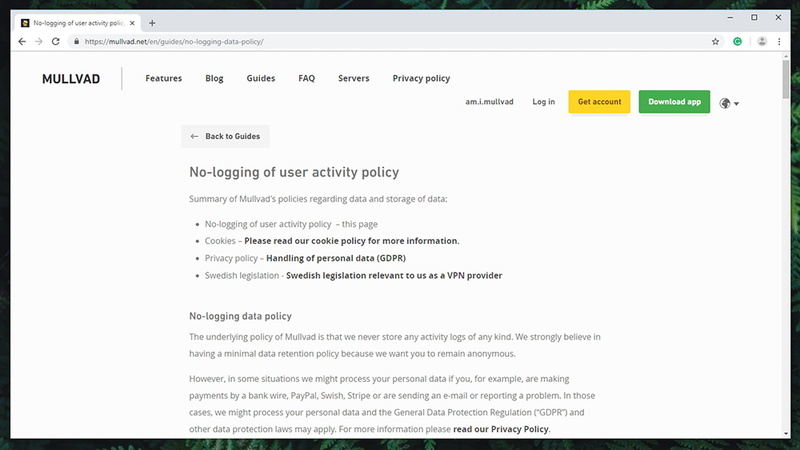 In terms of the way it handles your personal data, Mullvad is one of the most interesting VPNs right now. As said earlier, it even doesn’t store your email address. Instead, you get an account number that is used to track your payments. And to be 100% anonymous, you can pay via Bitcoin. The above-mentioned data can in no way be connected to your account. This means that in cases of data requests, Mullvad practically doesn’t have anything to give. Finally, we’ve also tested Mullvad for any DNS leaks. This is done by checking our what websites see about you, and they should only see what Mullvad serves them. So, here are the results. 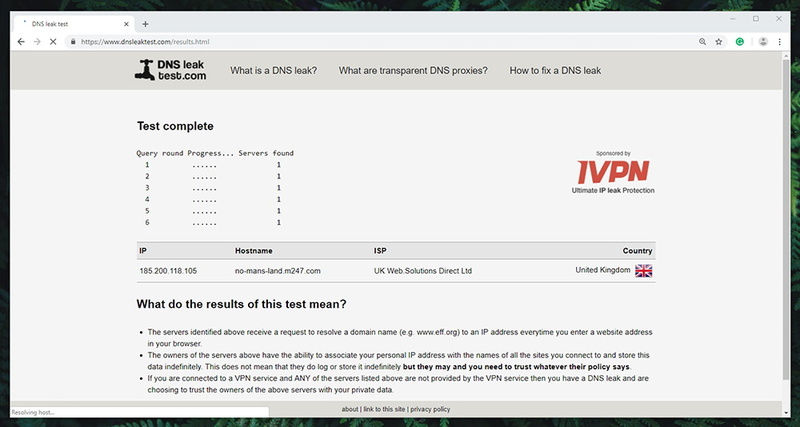 As you can see from the screenshot above, Mullvad doesn’t have any DNS leaks. 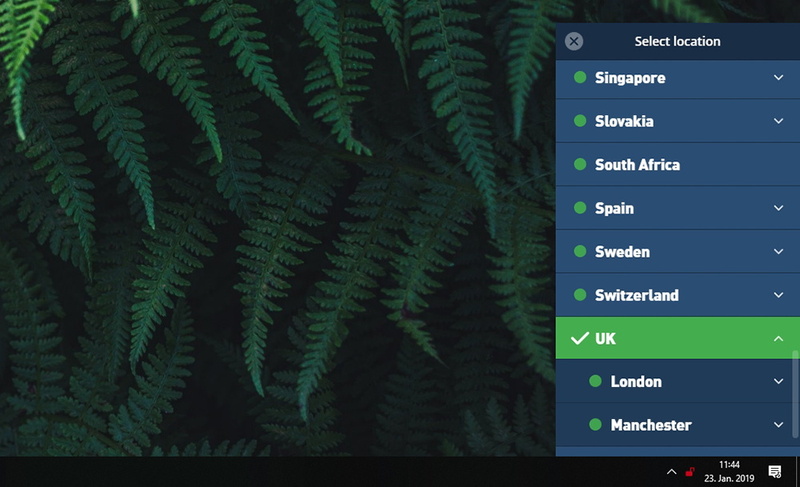 We’ve connected to a server in the UK, and that’s the only thing that websites can see. Differently said, your personal information along with your true IP address is hidden at all times. 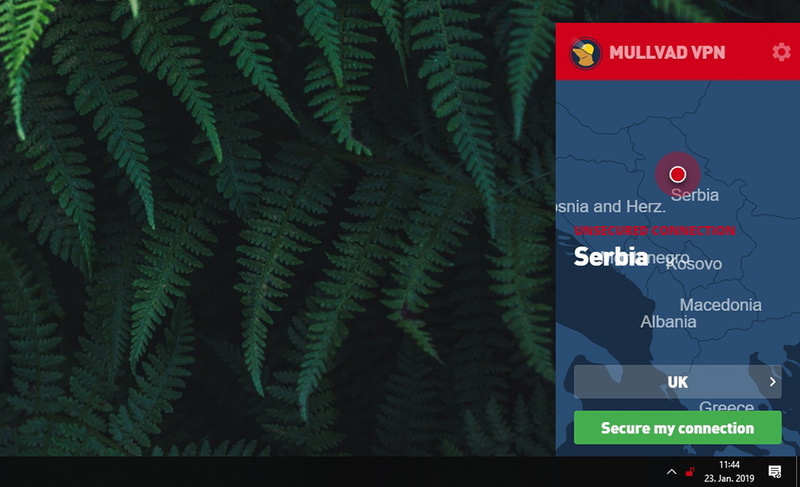 Mullvad is one of the speedier VPN we’ve tested so far by slowing down our connection by only 25% on average. Our Score: 8.5/10. Having all those security-related features is nice – but only if Mullvad provides reliable performance. This is why we’ve tried several of its secure servers and tested our Web speed each time. Let’s take a look at the results. The performance of our ‘naked’ Web connection. As we do in our every VPN review, we first test the speed of our ‘naked’ connection. This gives us the baseline data used to compare by how much Mullvad throttles our Web connection’s speed. As you can see, we got 148.61 Mbps for download and 9.60 Mbps for uploads. The performance of a nearby server (UK). Then, we’ve connected to a server that Mullvad believes is optimal for our geographical location. As it turns out, this server is located in the UK. We got 135.01 Mbps for downloads and 9.28 Mbps for uploads. We have to say that this is one of the best results we’ve gotten so far. The performance of a remote server (USA). Lastly, we’ve tested a server that’s remote in relation to your location. This one is located in the USA, which we believe is always a highly popular location for VPN users. We got 85.58 Mbps for downloads and 5.93 Mbps for uploads. To make sense of all of this, we’re going to put all these numbers into a table. We can say that Mullvad brings a speed downgrade of around 25%. That’s actually a very nice result since some of the top-rated VPNs can minimize this to around 15-20%. As you can see, Mullvad is very close to those numbers. There are different ways to get help – but there isn’t live-chat available. This means that in times of crisis, you’ll have to wait until your problem is resolved. Our Score: 5/10. When you’re buying any type of product, especially a digital one, you want to know what kind of support you’re getting. Even though VPNs are usually stable applications, something can go wrong at times. So, here are all the ways that Mullvad can help you. Guides: Mullvad has a dedicated page on its website containing a number of helpful guides. You can learn how to install it on a range of devices, and there are guides related to privacy, security, troubleshooting, and more. All of those come written in a friendly tone, which is perfect for inexperienced users. FAQs: There are around 35 questions answered on Mullvad’s website that you can check. Many of these have links where you can find in-depth information. With this said, we recommend this to be your first resource when trying to get help. Support Tickets (Email): You can submit a support ticket from within the application, or you can write to Mullvad via email. This VPN provider has a reputation for providing timely responses, which usually come within a few hours once you send a message. As you can see, Mullvad is missing live-chat support. This seems quite strange considering that this isn’t a brand-new VPN. With other 10 years of being available, this company could have developed a more reliable customer support system. When it comes to pricing, Mullvad is keeping it simple. There’s a single subscription plan where you pay €5.00 per month – which is around $5.60 if you’re not in Europe. If you decide to pay more upfront, the price doesn’t go down. For example, a full year will cost you €60, which is around $68. It would definitely be nice to see Mullvad offering discounts for ‘lengthier’ plans, which would be more enticing for new users. However, paying $5.60 for a monthly subscription isn’t much – especially considering all the nice features that this VPN brings. To put things into perspective, most VPNs charge around $10 per month, where to price goes down to between $4.00 and $6.00 per month if you go for an annual plan. 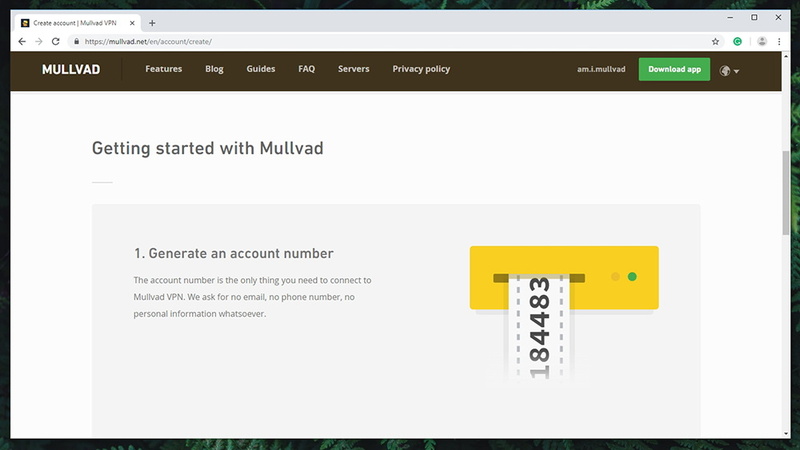 You can subscribe to Mullvad VPN by using a large array of payment methods. For full anonymity, you can go with Bitcoin. However, you can also pay with cash, credit cards, bank wire, PayPal, and in other ways. And finally, you can try Mullvad free of charge for up to three hours. After the trial period, you’ll be charged. Do We Recommend Mullvad VPN? It doesn’t come without downsides, but Mullvad is certainly one of the most interesting VPNs right now. 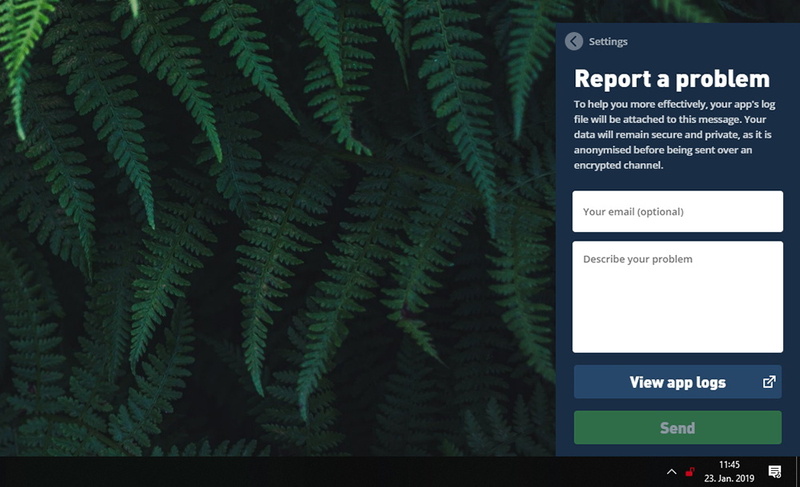 It can be hard to install on certain platforms and its native apps aren’t the best ones out there – but this VPN keeps you 100% safe and anonymous online. In addition, it brings incredibly fast performance while utilizing the latest available VPN protocols. PROS: Incredibly strong encryption; The latest VPN protocols; Amazing performance; No data leaks; No data collection. CONS: Limited platform availability; Not the best customer support; Can’t unblock popular media streaming websites (aside from Netflix). OUR SCORE: 6.6 out of 10! Mullvad is made for those who need the latest security features, and who don’t want anyone to track their online whereabouts. Considering that it’s one of the safest VPNs out there, it’s easy to recommend it those who need complete online freedom. So, go ahead and subscribe to Mullvad today! If you’ve made it this far, why not share this article online? And to stay on top of the latest tech news, don’t forget to follow TechNadu on Facebook and Twitter. Thanks! Mullvad is all about online security, as it doesn’t collect your personal data and it safeguards you against online dangers. And even though it unblocks Netflix right now, it’s not the best options for streaming as other streaming websites are out of its reach.